Instead of a sleeping pill or mood enhancer, consider filling your lungs with a breath of fresh jasmine. Brain scans revealed inhaling the scent of jasmine boosts the effects of a chemical called GABA on nerve cells, relieving anxiety and promoting rest. The results of the study were published in the Journal of Biological Chemistry. 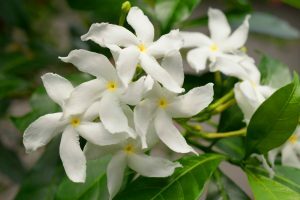 The researchers tested hundreds of fragrances to determine their effect on GABA receptors in humans and mice and found jasmine increased the GABA effect by more than five times. It’s effect was as strong as sedatives, sleeping pills and relaxants which can cause depression, dizziness, hypotension, muscle weakness and impaired coordination. “We have discovered a new class of GABA receptor modulator which can be administered through the respiratory air,” Ruhr University Professor Hanns Hatt told The Telegraph. Jasmine could be as a sedative, sleeping pill, and in the relief of anxiety and agression, Hatt said. The name Jasmine is derived from the Persian yasmin which means “a gift from God,” because of the intense fragrance of its flowers. It’s been long touted by aromatherapists as a natural remedy for stress, anxiety, depression, fatigue, menstrual cramps and menopausal symptoms. It is also said to act as an aphrodisiac. In addition to its scent, keeping houseplants in general is an excellent way to boost oxygen levels in the room and improve air quality. Researchers have found a direct link between stress and oxygen levels and shown that high levels of air toxins lead to anxiety and stress.